For a series that I was not a huge fan of, Blake’s 7 has popped up 3 separate times in my articles this year alone. This just goes to show that the articles I write really are randomly picked. If I picked the programs I watched every week myself instead of being random, there is a really good chance that Blake’s 7 would not be in the top tier of programs that I would pick. Did you notice that my favourite show, Doctor Who, is hardly ever featured on here? I think that’s what makes it fun. More than often, when I pick a series that I am not very interested it turns out that by the time the episode is over, I have found a new appreciation for that series. At the risk of going over old ground again, I never really took to Blake’s 7. I talk about that here. It is a series by all accounts I should have liked. It takes place in space and it has cool spaceship designs. What usually lets it down for me is the acting usually by the main characters. So far this year, I watched Orac which was alright but I found a ton of flaws to it. Then in May, I took a look at Blake. It was a massive improvement to what I had seen before. Though I know that the episode is of a very high standard because it was the final episode, I started to see what everyone else was seeing. Would finally I start to see why the fans of this series love it so much? 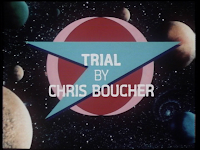 Just as when I viewed Orac, some major stuff was happening in the previous episode of Trial, Pressure Point. Blake is feeling guilty and responsible for the death of Gan. To deal with Gan’s death Blake decides to go off to a planet to think about his future and whether or not he wants to continue to lead the group. Of course Avon doesn’t help the situation at all. He continually reminds Blake (and everyone else) that because of Blake, Gan was killed. Blake leaves for this unknown planet. The much more interesting part of the story revolves around Travis with the Federation. He is on trial (thus the name of the episode) for killing thousands of civilians years ago. What makes this interesting is that these charges are brought up against Travis prior to anyone having the chance to go after Servalan for the mishandling of eliminating Blake. Blake and his band of renegades are causing a lot of problems for the Federation. Servalan wants to make sure that Travis does not have a chance to testify against her. The trial itself is not very interesting but what is kind of cool is a glimpse into the inside of the Federation. Secretary Rontane (who was previously seen in Seek-Locate-Destroy from Series 1) gives a lot of exposition into what is happening at the trial and that event, though Servalan is not at the trial, not only does she know exactly what is going on all the time, she is basically controlling it. Rontane is helpful to us the viewer to get an inside look of what is going on without us explicitly seeing Servalan doing it. This is where a character like Servalan is so golden. She is one or two steps of head of everyone, even people who are her own allies. She is basically the puppet master. She controls the strings and manipulates every one she can. She is a true villain and she is wonderful. I love watching her. Meanwhile on the planet, Blake has set up a way for himself to get back to the Liberator if the rest of the crew wants him back. He has met an alien called Zil. Zil is friendly enough and she actually thinks that Blake is one of her children. She has eggs all over the place. The problem is the planet is alive as a creature and will open itself up and swallow things. Sadly, soon enough Zil is one of the things that is swallowed. Luckily, just in time Blake is transported back to the Liberator. 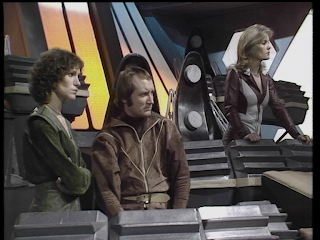 One of the things Blake was worried about was that the Federation might think Blake’s group and their cause would be forever hindered by the events in Pressure Point. Little does Blake know about the trial going on with Travis. Avon has created a way to make the Liberator basically a stealth machine and Blake decides to send the message to the Federation that he is still around. He gives orders to attack Servalan’s command ship. Travis is found guilty of the crimes against him and is ordered to be dishonorably discharged from the Federation and then executed. Just then, the Liberator comes out of nowhere and attacks the command ship. Before escaping, Travis pays a visit to Servalan and forces her to get a ship for Travis to escape. Based on what happened to Blake and his crew in the previous episode, this attack on Servalan’s ship is payback. This episode is sort of a Blake’s 7-lite of the series. The storyline gives us very little of Blake as he is mostly on the planet and even less of everyone else. The focus is on Travis and Servalan even the two characters do not share a scene until the end of the episode. As I mentioned earlier it gave us a little insight into the politics of the Federation and how Servalan needs to watch her back as she is feeling the pressure from the people within her government about what she is doing. One of the greatest eye-opening moments for me in regards to Blake’s 7 is when, about 22 years ago, a friend explained to me the general idea to how Blake’s 7 could be considered a anti-Star Trek series. It’s almost as if Star Trek and Blake’s 7 as series are in fact history books. Star Trek as it looks at the Federation from the winning side and Blake’s 7 from the losing side. Star Trek has a very optimistic view of the future. Even more so if you look at Star Trek: The Next Generation. Even in First Contact, we are told there is no money. Everything is Utopian and all the Federation wants to do is help out new civilizations and create goodwill. Obviously, that is a very generic and quick overview but Blake’s 7 Federation is power hungry. They allow slaves and they do whatever it takes to keep themselves as the major power of the galaxy. It two sides of the same coin as far as the “prime directive” is concerned. 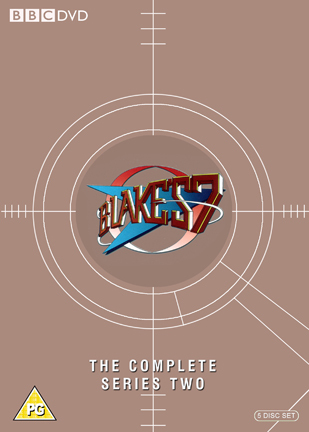 Now, I am talking as if it was a foregone conclusion that Blake’s 7 is a spin off of Star Trek. It is not but it really is an interesting concept. 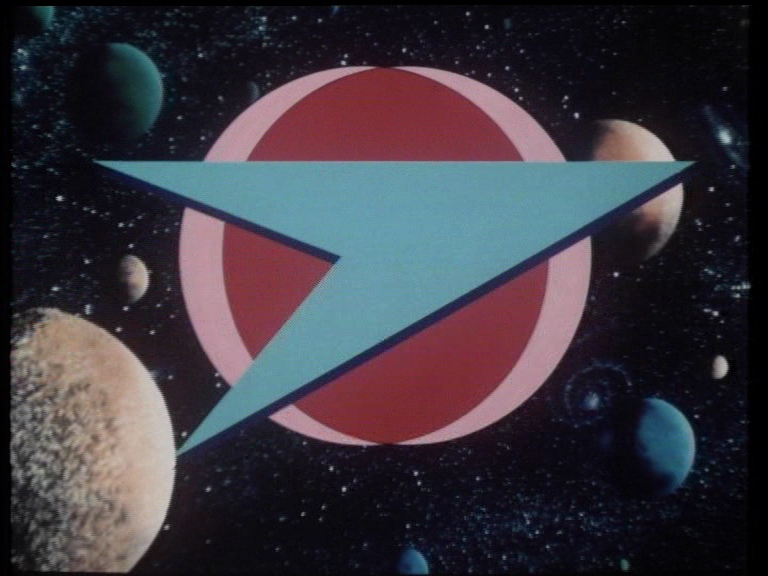 For Blake’s 7, even the Starfleet Insignia is flopped to its side. It’s actually pretty cool. You can tell the episode was in the good hands of someone with experience such as director Derek Martinus . I love his work and it shows off here. Shots of the crew on the bridge of Liberator are from above and the camera pans down to their level. Same with the shots of the trial. All handled expertly and a series such as Blake’s 7 really needs this. Just like Doctor Who, you need a director to embellish the good things going for the series and mask some of the more dubious designs and creations. After watching this episode, I came to the realization that I love this title sequence. This is still the same sequence used from Series 1. It is commanding and confident. The sequence for Series 4 has some good things going for it but it is dull. This sequence is great. With the theme music added to the visuals, it gives it all a vast and enormous feel of space to it all. It’s impressive and in some ways is on the same scale as Star Wars. As for the actors in the episode, once again Jacqueline Pearce as Servalan has to be the best thing in the series. It could be so easy to play it up and be camp yet she does so with an impressive turn of almost being sweet and non-emotional unless she has to be. It is all taken seriously and she dominates every scene she is in. We also get some decent guest stars with Peter Miles and John Savident who both put in solid performances. I also enjoyed Brian Croucher as Travis. I prefer Stephen Grief but Brian does a really good job of it this episode. Of course by this point Travis’ days are numbered. 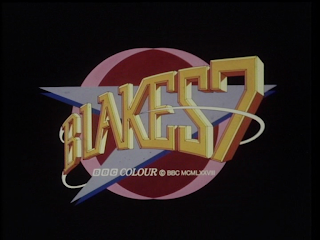 As far as how this episode fares in my overall interest in Blake’s 7? I am starting to get more and more into this series. I am curious to see more of the episodes that I have only heard about. I know how the series progresses so that is not an issue; it’s not just sitting down and watching this series. It is now something I look forward to doing soon. My DVD sets are just sitting on the shelf waiting….. This week we found out that Eric Sykes passed away at the age of 89. If you ever get a chance to see the early episodes of Sykes And A …. from the 1960s then please do so. It is funny and unique. In this series he also partners with Hattie Jacques who I adore. We also say farewell this week to James Grout. To me, James will always be the overly indulgent vet Granville in All Creatures Great & Small whose character is married to Zoe played by the beautiful Pamela Salem. James appeared in such series as Inspector Morse, Rumpole of the Bailey, Yes, Minister, Z Cars, A Very Peculiar Practice and so much more. James Grout was 84. Next week: I need a break and am going to rest. I am tired and I think it is showing in my writing. I will post one of my unpublished articles that I have handy to go when I want to take a week off. Next week I move away from television and listen to the soundtrack for Series 2 of Sherlock. I am very glad you are feeling more optimistic about Blake's 7. Just as in any other long-running series there are some clunker episodes, but overall it really is a lot of fun. When it is bad, it is very bad, but when it is done well, it can be exceptional. 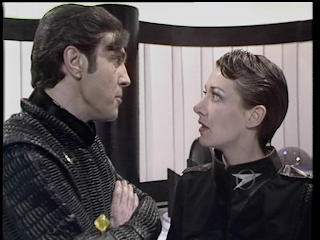 Servalan and Travis are a great tag team of villainy, and Avon is a tremendous character himself. I look forward to your analysis of a soundtrack! Its fun picking random episodes and shows to watch sometimes. Last week for part of our international TV day we had open show night in which myself and the other person in the club doesn't have a choice as long as it meets our guidelines for theme chosen that night. I don't know how, but Dempsey and Makepeace a show an outsider brought stole the night. Over The Avengers with Cathy Gale, The Sweeney, and the Professionals. Good to see your still going strong. Servalan and Travis are indeed exceptional. 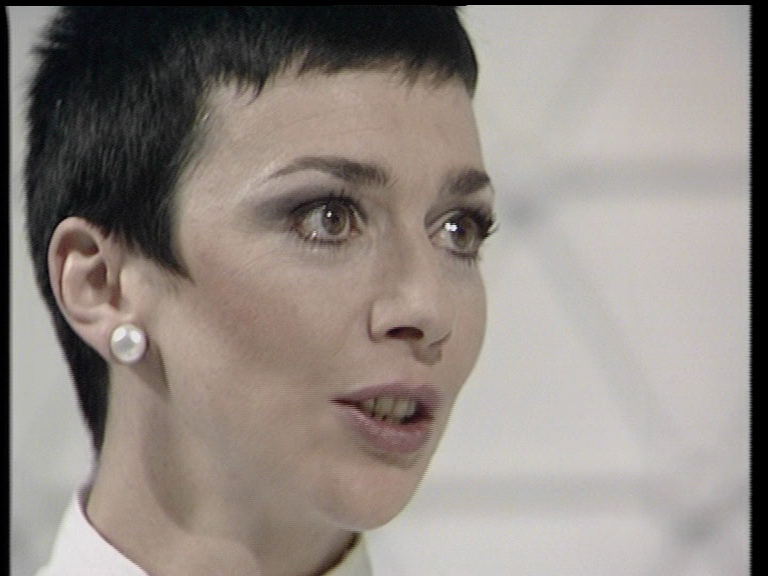 What I have seen of Servalan is that she is never over the top which could be really easy in a character like that. 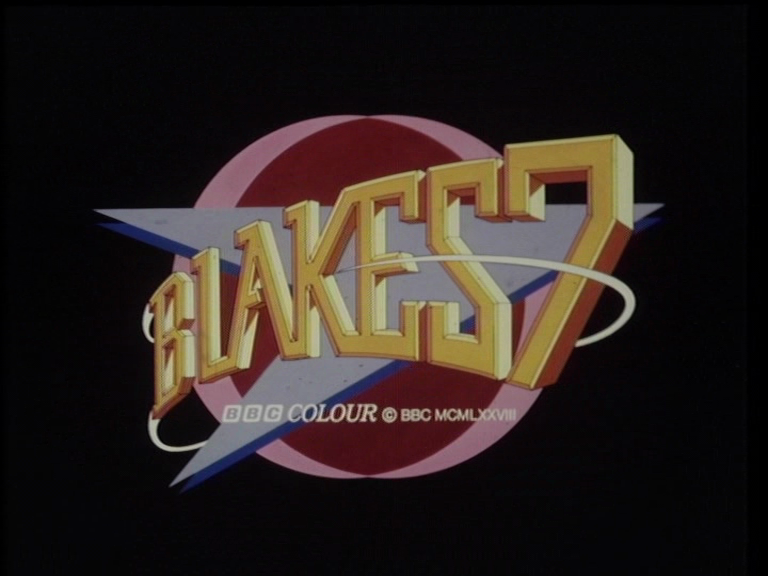 At some point I need to start re-watching Blake's 7 but maybe skip the first couple of episodes as I have seen those too many times! Still going strong. The blog makes me really pay attention to what I am watching and makes me really think about what I feel about what I am watching. If I don't like what I am watching, I force myself to really think why that is other than maybe I just don't like it. I am glad you are getting people together to watch stuff that maybe you or others haven't seen before. There's still a ton around my place that I either bought or acquired and as of yet have not watched. Are you still working on your blog? I've got a blog, but with me being a full time student. I just don't have much time outside of classwork for myself. The one thing I do make sure I have time for is the gatherings I run with the other co-founder. Since I only choose 40 percent and the other co founder chooses 40 percent of what is shown the other 20 percent going to the other members. That leaves a possibility of 60 percent of shows which maybe myself or the other guy hasn't seen before. Which oddly enough happened for the first time at last meeting to both of us. Next month SciFi for us still thinking on what other series to show besides Timeslip and Tomorrow People.